Alright, loves! 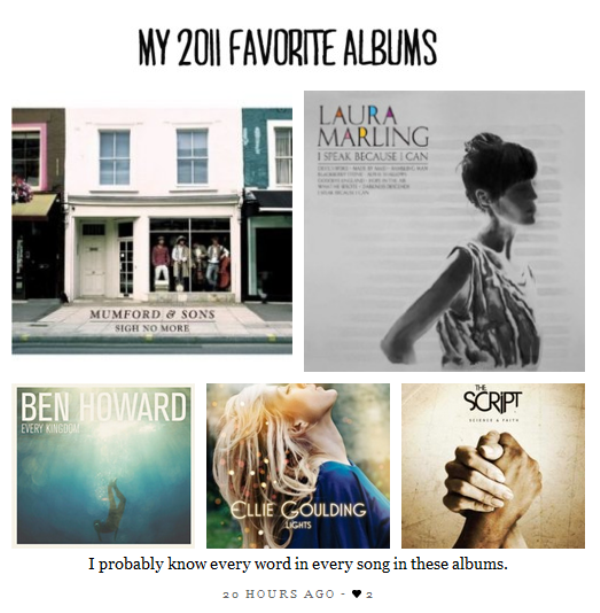 It’s been a good and musical year, so I’ve decided to list down my favorites for this year. I probably know every word in every song in these albums. So that’s Lucy Rose, Marcus Foster, Diane Birch, Ben Howard, Benjamin Francis Leftwich, Foster the People, and The Head and The Heart. This song is a gem. Just a gem. Just a fun and upbeat song that always makes me happy. Just your usual feel-good, live life! kind of pep talking songs. Haha. Ah, the honesty of this song, I just love. And Gotye looks really good here! This wasn’t my initial favorite, cause “Only Love” takes that, but it didn’t actually take me long to realize how good this song is. I actually am considering tattooing the word “gracious” in my body now. Aaaand, the Ben and India harmony is precious. I’m still convinced that this song was written for Marcus Mumford, but besides that interesting back story, I just love the power behind this song. It starts all slow and fragile, and then it rages on powerfully in the end. Woman power, Laura! Third time this man appears in my blog, second time this song makes it. Should I start gushing about Marcus Foster again or you already get it? Yeah, I thought so. Just listen to it. Confession: I was not paying the singlest bit of attention when I first heard this song. Not one bit. I was in the bus, for Chrissake. The second time I heard it was a different story. I literally stopped from the shoe window shopping that I was doing, looked up at the ceiling, hoping to find the speakers, ready to scream, “IS THIS THE SCRIPT? WHAT IS THIS SONG? TELL ME!” I’ve loved it ever since, and can never not sing along every time it plays. I can not help it. Quite honestly, Torches was almost on my favorite albums list, since I liked probably more than half of the songs in that album (Houdini, Helena Beat, Waste, I Would Do Anything For You, Don’t Stop (Color on the Walls), Call It What You Want) but I want it to settle for a while first, since I only got the album I think last October? And in all fairness, Sigh No More, I Speak Because I Can, Science and Faith, and Every Kingdom practically lived in my Mp3 player for months while Torches made it in and out, and only garnered ‘staple’ status maybe two or three weeks ago (after the realization that I think Mark Pontius is gorgeous and their music really makes me cheery and ok, they’re cute guys and it’s fun watching their videos). Yes, please, shoot me but this is my guilty pleasure for this year. I love listening to this song to the point that I’ll go against the rules of using multiple exclamation points!!! Kudos to Drew Barrymore, cause this video is aaaawesome (read that the way Barney Stinson would have said it)! I watched it probably too much already, but it reminds me of West Side Story, only the guys are less gayer. Haha. Plus, Troy (from Community)’s here! wish Abed was, too. Haha. I’m sorry, but Ponsi and that drum set first thing in this video? I was sold the minute I saw it. Previous PostPrevious Au Revoir, 2011!